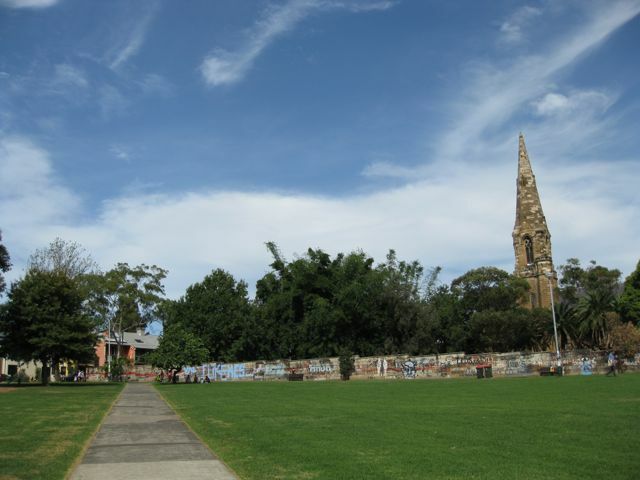 Daniel and I used to live in Newtown in Sydney's Inner West. This is where people who never want to grow up live, a suburb crowded with perpetual adolescents, greying Peter Pans all. Forty-year old men clutch skateboards under their arms whilst ordering their soy latte to go; ancient spray-paint artists flog their wares on the pavement; script editors sit in cafes all day long pencilling ammendations into their scripts. Tattoo parlours next to cheap Thai restaurants next to second-hand fashion boutiques line the streets. There are plenty of genuine adolescents and students leisurely meandering about and an inordinate number of lesbians. I always felt obscenely naked in Newtown, walking around the area without a tattoo and conversely ludicrously overdressed wearing shoes and socks instead of flip-flops (sorry, I mean thongs). There are only a few things I miss about Newtown's Camden Town-in-the-sun vibe. One is Berkelouw Bookshop (secondhand department) and its attendant cafe (and their eggs florentine). The other is Camperdown Cemetery. 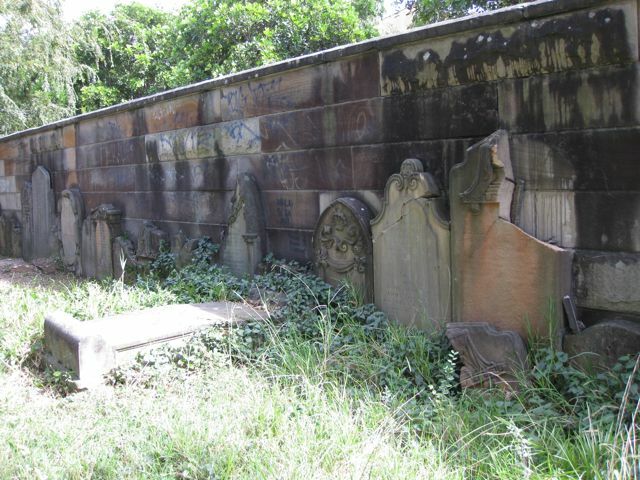 Camperdown Cemetery is the oldest in Sydney but much of it is has been removed to make way for a public park. In 1946 all the gravestones in the area designated for the park (eleven hectares in all) were dug up and placed inside a new perimeter wall marking the much-reduced cemetery. 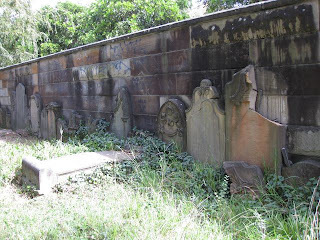 Idiotically, these transplanted gravestones were bolted onto the inside of the brick wall with steel pins and nearly all have subsequently shattered as the pins quickly rusted under Sydney's relentless sun and rain. Beyond the wall, children and dogs run about and picnics are unwittingly eaten on a grassy hill stuffed full of corpses. The wall itself is now patently considered the property of graffiti 'artists'. At the entrance to the remaining cemetery is a magnificent Moreton Bay fig tree planted in 1848. To the right of this is a lodge or cottage of the same period which has been criminally neglected. It's lived in by Christians, friends of the vicar, who himself dwells in the larger, newer and similarly decrepit vicarage opposite. Unfortunately, they're far too busy saving souls to save buildings. Each Sunday they set up trestle tables outside the lodge and welcome anyone in for a post-service lunch complete with tea from a gigantic urn (not a glass of wine in sight). 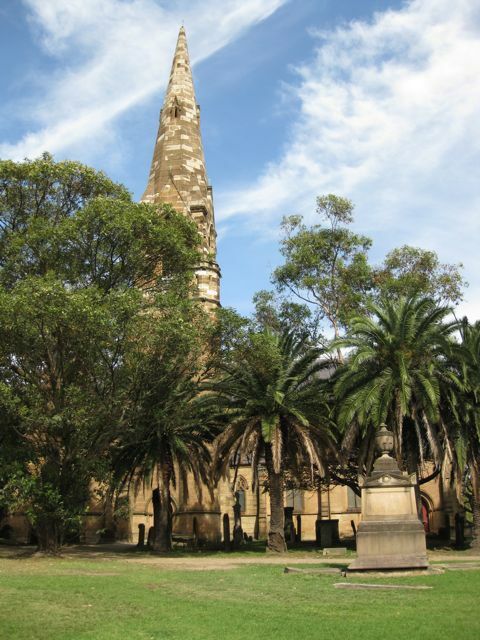 Every time I passed them, quietly praying over their outdoor picnics, I wanted to march furiously in, like Jesus into the temple crowded with moneylenders, turn over their tables and chairs, and chuck them out for their filthy abuse of Sydney's heritage. Then I'd move in, take over with Daniel, respect the lodge and lovingly restore it. 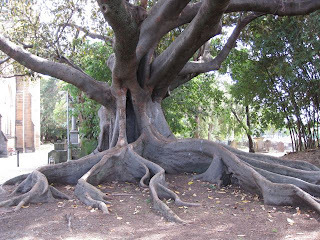 Decrepitude can however be rather picturesque. 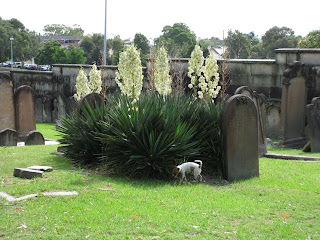 And thanks to the dedicated work of some local botanists parts of the cemetery were always brimming with rare, native plants cascading over fading tombs. The wonderfully named Bathsheba Ghost: convict and Second Matron of the Sydney General Hospital. William Moffat: printer, stationer, and engraver with, once, "the handsomest shop in Sydney". Nicholas Charles Bochsa: Napoleon’s harpist eloped from London with Sir Henry Bishop's opera-singing wife but he died after they gave but one concert together in Sydney. Sir Thomas Livingstone Mitchell: explorer and land surveyor who gave his name to the fantastic pink and white ice-cream sundae-like Major Mitchell’s Cockatoo. Eliza Donnithorne: purportedly the inspiration for Miss Havisham in Dickens’s Great Expectations, jilted on her wedding day she refused to have the wedding feast removed from the table and kept her front door permanently ajar in case her absconding lover should return. 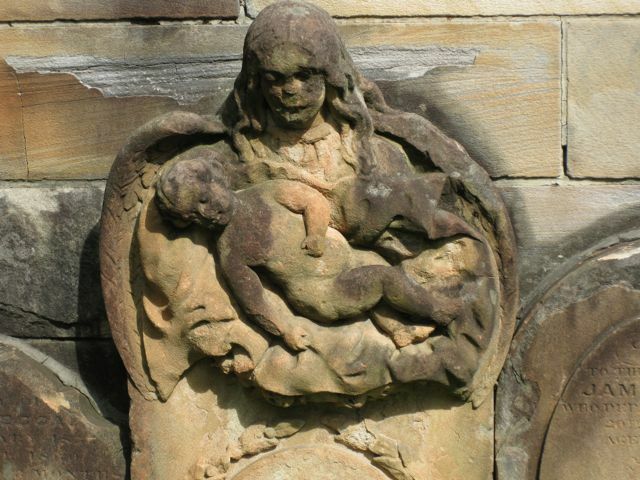 There is also a large tomb commemorating the victims of the Wreck of the Dunbar. This clipper ship (clippers were the fastest sailing boats of the mid-ninteenth century) went down off Sydney Heads in August 1857 after a voyage from England, with all but one of the 122 people aboard perishing. 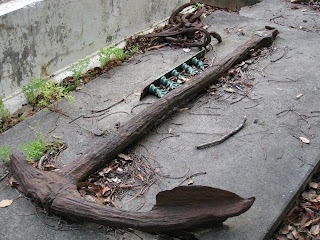 The wreck "had a profound effect on the people of Sydney, because nearly all the passengers were Sydney residents returning home". The new perimeter wall created when the cemetery became a tenth of its original size has to bulge outwards to incorporate this tomb as Sydneysiders wouldn't countenance its removal into the smaller site. Many of the other graves bear testament to the fact that most people in the nineteenth century died at an extremely young age - of measles, diptheria, snake-bites, teething (those pesky mercury based teething powders), drowning...It's best not to dwell too long on the dates borne on the gravestones but rather to wander aimlessly admiring vistas and taking in the effect as a whole of slowly decaying memorial grandeur. I highly recommend it as a soothing tonic or antidote to the adolescent angst and narcissism of nearby King Street. Yours is a lone and funny voice in the maelstrom of life in 21st-century Sydney. It should have musical expression too.